Over 40 million active users are on Pinterest, and a growing number of those users are bloggers, companies, brands, and businesses. There are many opportunities to expand your reach and find your audience within the unique community of Pinterest. Although Pinterest marketing technically falls under the umbrella of social media marketing, Pinterest for business requires its own special considerations and best practices, which contribute to its reputation as an extremely fun, exciting network to use. Women continue to dominate Pinterest with 42% of U.S. women online now using the platform, compared with 13% of U.S. men online. According to projections by eMarketer, over 25% of U.S. social network users and 18.1% of all internet users will use Pinterest on a monthly basis this year. By 2019, the network’s monthly user base is estimated to be 59.3 million. That’s just about 30% of all U.S. social network users. Users who willingly and actively share their product preferences, buying intentions and aspirations. 1. Create a business profile – Add your business name and upload your logo (250px x 250px). Add a short keyword-rich paragraph about your company in the ‘About’ section, making sure to note what users can expect from your brand on Pinterest. Connect your brand’s Twitter and Facebook accounts, which will add their icon links to your profile. Don’t forget to include the all-important URL to your website. 2. Create several boards – Create interesting boards with creative (but searchable) names that are related to your specific business and related industry. Don’t believe the myth that Pinterest can’t work for service-based businesses! If you’re a hotel, pin images of travel destinations, packing tips, local events, and other brand-related content and photos. Just like on Facebook and Twitter, not everything should be all about you. 3. Pin consistently – Don’t overload your followers with too much content at one time, especially when you first start out. Instead, aim for a steady flow of content and pinned images. Watch for times when your followers are actively using Pinterest the most and pin at those times (we’ll discuss averages later in this post). 4. Comment on others users’ pins – Don’t be afraid to be social! Just like on other networks, you want to get out and have conversations around your brand. Add value and awareness by commenting on other pins (no sales pitches!) and thank users for pinning photos from your website. 5. Like other users’ pins – You can ‘like’ or ‘favorite’ other users’ pins by clicking on the heart icon. This concept is similar to Facebook ‘likes’ or Twitter ‘favorites’. You can also ‘like’ pins you want to refer to or comment on at a later date. 6. Pin from a variety of sources – Don’t just pin from your own website. Curate your pins from a variety of industry-related sources. Remember to be careful about violating any photo copyrights. 7. Don’t over-promote – Your boards should be a natural mix of your own brand's content and related content. Just like marketing on ANY social network, avoid over-promoting your own business, as you will come across as “spammy”. 8. Optimize your website for Pinterest – Add ‘Follow Me on Pinterest’ and ‘Pin It’ buttons to your website. If your website is an e-commerce site, make sure to add the ‘Pin It’ button to your product pages as well as your business blog images. Let’s start with image size. The winning image size appears to be 600px x 800px. This resizes and displays in boards as 192px x 256px, which gives most images enough visual presence to not get lost in the noise, and the image will enlarge fully once clicked on. ● Use high-quality images, making sure they are in focus and well-composed. ● Vertical images are the preferred style on Pinterest, which may be due to the fact that vertically-oriented Pins look better on the mobile app. ● Pins with multiple images (collages) can work well for certain categories (exp. DIY How-tos), but keep it to 4 images or fewer. ● Images with less than 30% background (e.g. whitespace) are re-pinned most often. ● Re-pins decrease by 2 to 4 times for images with 40% or more background. ● Brand images without faces get re-pinned 23% more than those with faces. Less than 20% of the total images on Pinterest show faces. How exactly do you create Pinterest-perfect images? You can create images from scratch, building an image with Pinterest-specific dimensions and aspect ratios in PhotoShop or other image editing software. But if you are looking for something cheaper and easier, online tools like Canva or PicMonkey both offer premade templates for Pinterest. The Canva template is 735 pixels wide by 1,102 pixels tall (a 2:3 aspect ratio). The PicMonkey template is a collage style and is sized 700 pixels wide x 1000 pixels tall. Recent data suggests that 20% of pins fall in the Food and Drink category, 12% are DIY & Crafts, and 11% are Home Decor. These categories skew heavily in favor of female followings. The top categories for men are not the clichéd sports, technology, and cars, but rather photography, art, design, and home decor. 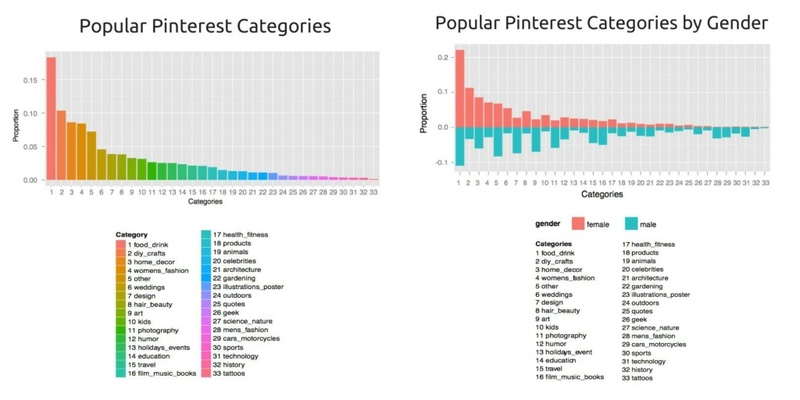 If your product or service is male-oriented and falls into one of these categories, you should take a longer look at capitalizing on Pinterest marketing. Looking at user data on a month-by-month basis shows distinct trends in seasonal aspirations. Pins for holiday categories begin to rise in August, while gardening and outdoor activity pins start to increase as early as December. Health and fitness topics see a spike in activity in the early part of the year, coinciding with New Year resolutions. Zooming in further to look at daily pinning, trends in activity can be seen by the hour. These shifts in activity show that Pinterest is firmly embedded in the daily lives of its users. There is little pinning activity happening at night, steady pinning activity throughout the day, and then a spike in the evening. 32% of all Pinterest activity happens during the central part of the work day, between 10am and 4pm, while 18% of all pinning activity happens in the evening, between 9pm and midnight. This pattern of activity is unique when compared to other social networks: Facebook activity falls continually after 3pm, as does activity on Twitter.